Assemblage and ceramic sculpture along with drawings, paintings and art quilts explore humankind’s social and environmental impact on the earth as part of The Quicksilver Mine Co.'s current exhibition, Legacies. For this show, Willits artist Linda MacDonald joins Sonoma County sculptors Nuala Creed (ceramics) and Bear (assemblage) in an interrelated mixed-media exhibition expressing a unified concern for the world environment. Working with young people her entire life, Nuala Creed uses the figure of the child to help her address socially relevant themes. Her ceramic "Eco Children" engage allegorically, gently urging the viewer to look for alternatives to war and to protect the earth. 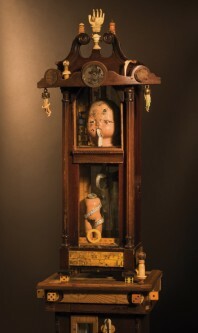 Creed received her BFA in Ceramics with High Distinction from the California College of Arts and Crafts, and has exhibited extensively throughout California and the United States. Building intimate and meticulous assemblage sculpture out of old children's furniture, dolls, found objects, paper ephemera, dead bugs and small road kill, Bear explores humanity's dark side with irony and a sense of humor. She also attended the CCAC, but primarily considers herself a self-taught artist. This is Bear’s second exhibition at Quicksilver. "The Silenced Oracle," by Bear. 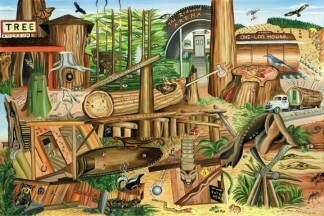 "The Redwood Highway," by Linda McDonald. Living in Mendocino County for over 30 years, Linda MacDonald's artwork focuses on northern California regional issues. Aging tourist attractions, the impacts of logging on the environment, and the more recent economic impact of the demise of the timber industry along with the related effects of all these on wildlife and the natural environment emerge in her quilts, drawings and paintings. She received her MFA from San Francisco State, and has exhibited both her fine art and her art quilts locally and nationally. 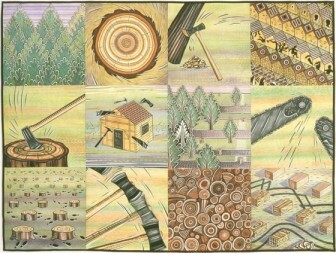 "Lumber, Trees, Houses, People", by Linda MacDonald. Legacies opens on August 8th. An Artist Reception will be held on Saturday, August 9th from 4—6pm; the Show continues through September 14th. 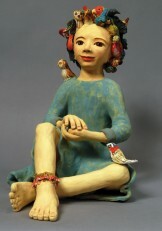 "Bird Girl," by Nuala Creed. "Bug Boy," by Nuala Creed.